Dinner With The King Recap - Will WM35 Be The Longest WrestleMania of All Time? Will Cena Replace Corbin at 'Mania? Why WWE Should Embrace A Rotating Off Season, More! Lawler opens today’s show by talking about the in-commercial texting habits of WWE commentators. Moore recalls Lawler texting him one time during a RAW commercial and he couldn’t believe it. Lawler says that all the commentators text or tweet during commercials. He notes that WWE doesn’t care if the commentators are on their phones during the commercials, but adds that they’d probably prefer that the announcers tweet instead of text because they’re passionate about their social media presence. Moore notes that there are currently 10 matches announced for this year’s WrestleMania. Lawler informs that he has heard through the grapevine that this year’s WrestleMania will have 13 or 14 matches and will be the longest WrestleMania ever. 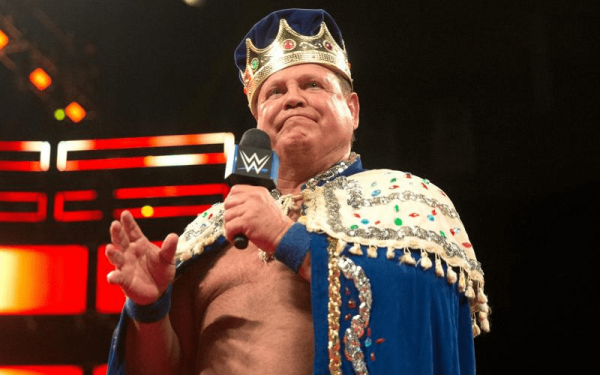 Lawler says he will be at the show, and he assumes he’ll be calling a match or two. He points out that with 13 or 14 matches, there’s no way one or two announce teams can call of that action, so he assumes he’ll tag in once or twice to spell one of the announcers. He adds that he’ll probably be on the Kickoff Show as well.